A few days ago, I ran into an acquaintance of mine in the produce section of a grocery store. With a weather forecast calling for several rainy days in a row, I had a hearty chicken sausage and vegetable soup on the brain. My friend, an accomplished baker and avid cook, gave me a sheepish look. I had to laugh at that, because while she’d caught me in the vegetable aisle, I had two very conspicuous loaves of store-bought bread and a box of bakery chocolate chip cookies in my cart. I’m certainly no saint. I have zero business looking askance at what anyone else has on the conveyor belt. Grocery cart scrutiny is not cool, folks. The way I see it, we’re all managing as best we can, especially at this busy time of the year. In late spring, I barely have enough time to eat a sandwich, let alone bake the bread for one. Shortcuts are my friend. Frazzled nerves need carbs and I’m not going to apologize. Uh-uh. These are desperate times. That’s why I’m leaning towards simple, one pot dinners when at all possible. 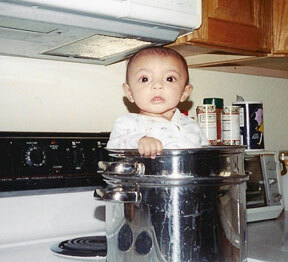 Who needs the hassle of extra pots and pans? Who wants to wash an extra skillet if they don’t have to? Don’t we all have children to cart to awards ceremonies and Field Day and end-of-the-year BBQ’s? Even if you don’t have kids to schedule things for or chauffeur around in slavish fashion, I think a tasty, healthy, easy dinner is something we all can use. This recipe definitely fits that bill. 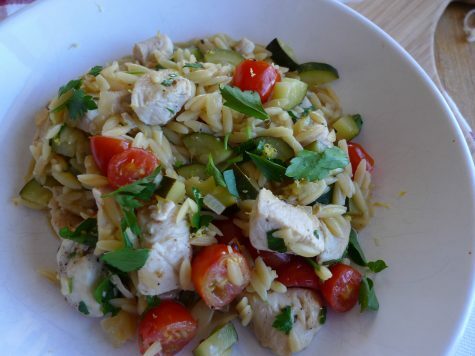 This skillet supper comes together in under 30 minutes and is a complete meal in a pan: tender chicken, saucy orzo pasta and fresh spring zucchini and tomatoes come together in a flash, and with rosemary and a kiss of lemon and red pepper flakes to brighten things up, you’ll have a happy dinner table. 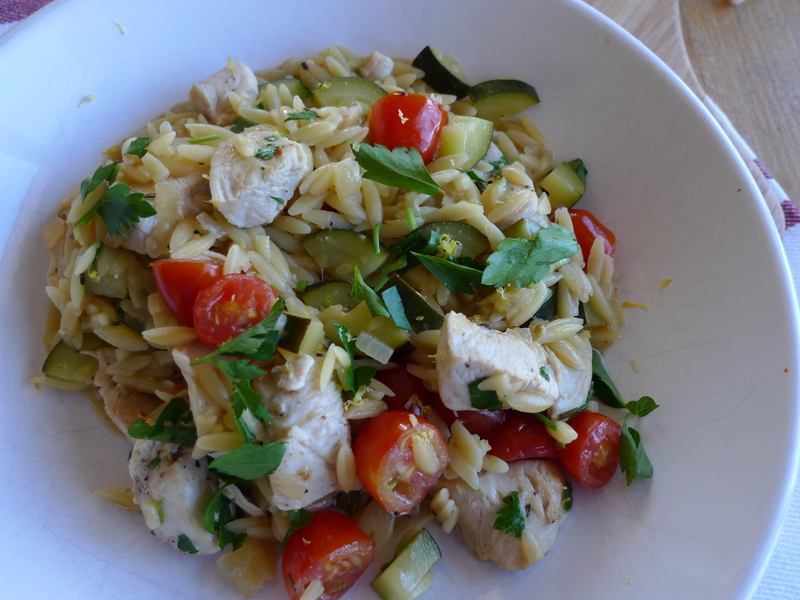 A few notes about the orzo–the orzo is cooked in just enough liquid to render it toothsome and allow it to release a nice amount of starch, which gives the dish a lovely, creamy consistency not unlike risotto. But better than risotto, because you don’t have to babysit it on the stove while it cooks. If you can find whole wheat orzo, feel free to use that, as it’s got more fiber than the regular variety. I couldn’t find whole wheat orzo to save my life, but if you can (and like whole wheat pasta) go for it. The lemon juice in the dish really gives it a spring-like feel, but the finished product is quite lemony, so if you’re unsure, add half the amount of lemon juice to start, and then adjust to taste. I really enjoyed the kick of citrus, but feel free to ease your way into it. Same way with the red pepper flakes–I always go heavy on the zing, but that’s a matter of taste. I also tend to go heavier on the black pepper because I’m spicy like that. The recipe doesn’t call for any parmesan, but if you’re of a mind, a nice grating of good-quality Parmiggiano-Reggiano cheese is never, ever a bad idea. I’ll be the last one to judge, I swear. Heat 1 tablespoon oil in a large, deep skillet over medium high heat. Add half of the chicken and cook on until browned, about 2 minutes total. Remove chicken with a slotted spoon and transfer to a plate. Repeat with another tablespoon of oil and the remaining chicken. Add the remaining tablespoon of oil to the skillet. Add the onion and the garlic and cook for about 30 seconds. Add the orzo and rosemary and cook, stirring, until the orzo is slightly toasted, about a minute. Add the chicken broth and when it boils, stir, cover the pot and reduce the heat to medium-low. Cook for 5 minutes. Uncover pot and add the zucchini; then re-cover the pot and cook for 3 minutes. Uncover the pot and add tomatoes, lemon juice, salt, pepper and red pepper flakes. Stir, re-cover the pot and cook for another 3 minutes or until the tomatoes soften. Remove the pot from the heat and let stand 10 minutes. Stir in the parsley and garnish with lemon zest, if desired. When we lived in New Haven and would go to the Stop & Shop to get groceries we could always identify the college kids by the copious amounts of Lean Cuisine they would buy, but that’s about as far as I would go on the cart-shaming route. The idea that people are judging because one had store-bought BREAD blows my mind, though–is it the fact that it’s not homemade, or the fact that you’d be allowing bread to be in your home at all? You would probably really like my grocery store–instead of a conveyor belt the cashier scans everything from the cart directly, so there’s less of a chance for people to food-shame your final purchases.